A travel card for tourists will be introduced in Moscow in 2013, covering all types of public transportation. Tourism industry players are hopeful that a museum pass will be the next logical step for the city. Moscow will soon offer tourists a public transportation pass, RIA Novosti quoted head of Moscow’s Department of Transport and Road Infrastructure Development, Maxim Liksutov, as saying. “The travel card will be a one-day multiple ticket covering all types of public transport,” Liksutov said. The pass, which is to be introduced in April 2013, will cost 200 rubles ($6). “While a transport pass for tourists is not actually a factor that will help attract tourists to the city, it will certainly improve Moscow’s image as a tourist-friendly city,” said Irina Tyurina, spokesperson for the Russian Travel Industry Union. 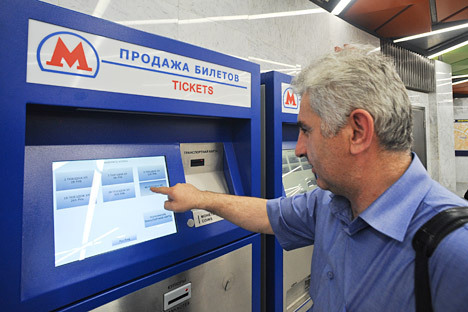 “There are often queues to buy metro tickets, and many people are at a loss as to where they can buy trolleybus tickets. They have no idea that you can buy them from the driver. A transport pass is what tourists really need. Whether or not it works will depend largely on how well we inform people about it,” Tyurina said. “With Moscow traffic being so congested, tours around the city are often planned using public transport, mostly the metro,” head of the domestic tourism department at Intourist, Yelena Soldatkina, said. Experts say it would be a reasonable step to introduce a single pass that offers visitors discount entry to several museums, as well. “Many countries have visitors’ cards for tourists, with discounts for public transport, museums and even souvenirs at some shops. St Petersburg has already introduced such a visitors’ card,” said Tyurina. In the past two years, Moscow has put a great deal of effort into becoming more attractive for tourists. For example, the city now has street signs in Russian and English, as well as double-decker red sightseeing buses. Moscow authorities have also done a lot to allocate safe and convenient spots for tourist bus stops. Last week, Moscow FM, a 24/7 English-language radio station targeting both foreigners working in Moscow and tourists, went on the air for the first time. The station plans to become a guide to the city’s sights and places of interest. According to the Russian Federal Agency for Tourism, 21.2 million foreigners visited Russia in the first nine months of 2012 ‒ up 13 percent from last year. In the first six months of 2012, Moscow received nearly 2.5 million foreign guests, which is up 18.5 percent from 2011, according to Moscow’s committee for tourism. The article is abridged and first published in the Vzglyad newspaper.